To save time I have split these into several pages. Use buttons at the bottom to navigate. Turn those dull photos in something worth looking at. On the following pages you will find samples of frames. Special effects, such as lighting, page curl, atristic edges and more. I will make ONE FREE for your page. If you want more send me e-mail for details! Now what you have to tell me. 1. 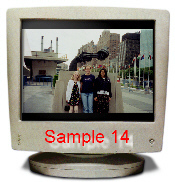 The frame sample number. 2. The special effect (if any) number that you would like. 3. Approximate size of framed picture. In pixels or inches. 4. MOST importantly!!! Either send me the picture or tell me where I can grab it. The URL. 5. As with my other graphics you must put my link on you page. On the following pages I will show some of the EFFECTS that can be done. I will use the same picture for all of them. Most of them can be included in the FRAMED picture. If you wish you can just have the effect added to your photo.